Our first full day on the road (or rather the airways) began with a landing at Warburton International Airport and a short ride to the Tjulyuru Regional Arts Centre with our host Albie Viegas. Tjulyuru is unique among the centres that we visited in that its emphasis lies far more in cultural preservation than in the creation of art for the market. Although we found art work for sale, much of our time was spent marveling at the richness of over fifteen years of accumulated cultural expression in painting, video, song, and craft. The Centre itself is an impressive, relatively new facility that is impeccably maintained. At the entrance stands an old, rusted out truck body from the days of the Warburton Mission. From there buildings extend down either side of a central mall. On the left is a series of galleries. A small gallery held pottery and other craft items for sale. Beyond that there is main gallery—over thirty metres I think, but my sense of distance is notoriously inaccurate—and a smaller, more intimate space that’s perhaps eight by eight metres. There’s plenty of natural light. 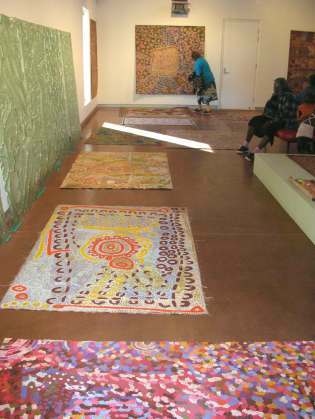 These galleries were filled with large canvases in a variety of styles from naïve drawing to dense and complicated dot paintings, many of which are illustrated in Ngayulu-Latju Palyantja: We Made These Things (Warburton Arts Project, 1999). 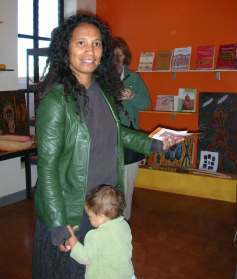 You can get a wonderful tour of the gallery in the round at the Virtual 360 Tour on the Tjluyuru website. When we arrived at the Centre, the walls were hung with paintings, and more were stacked in the centre of the room. Several artists had turned up early to greet us, chief among them Elizabeth Holland. As were waited for more members of the community to join us, Albie suggested we spread out the unstretched canvases in order to gain a better appreciation of the wealth of cultural material encoded in this massive indigenous library. We went at it with gusto, lifting the enormous paintings and distributing them across almost all the available floor space. It was a fantastic display, rich in color and story. The Centre was beginning to fill up with women and children (and a few men, including Fred Ward Tjarurru). The slow movements of a chilly early morning began to give way to animation and excitement as the artists re-acquainted themselves with paintings and stories that were sometimes fifteen years old or more. A pair of ladies sprawled across a padded bench and began chatting to one another in Ngaanyatjarra, pinting to a canvas and tracing the story across its surface. Finally, one of them looked up and began to interpret the work for us: the story of a bush turkey and his family, of a young turkey who became separated from the rest, and somewhat like the prodigal son, was happily reunited at last. “Look,” they said to me, pointing to the edge of the painting, “they go away all together.” “Everybody happy?” I asked. “Happy,” came the reply. Also on display in the main gallery for the first time in many years were the impressive glass panels. These were originally planned as windows for the center, and measure 180 by 100 cms each. 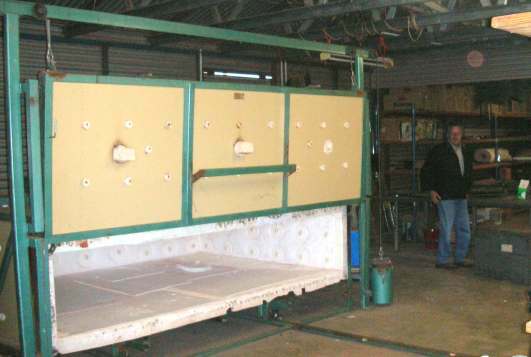 Unfortunately, construction costs overran the budget and it was not possible to install the panels in the building as planned. 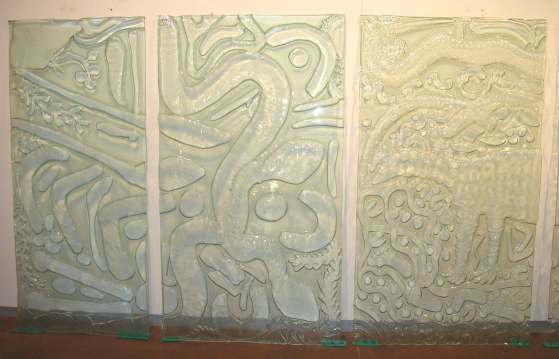 These panels were created by scooping out traditional designs in the sand and making casts from them. Later in the morning we were taken down to see the kiln where the glass is fired. Glassmaking is an ongoing artistic activity at Warburton, and we saw numerous examples of small art glass pieces that have been recently produced. The building where the kiln is housed also holds a storeroom where paintings and carvings for future exhibitions are stored. 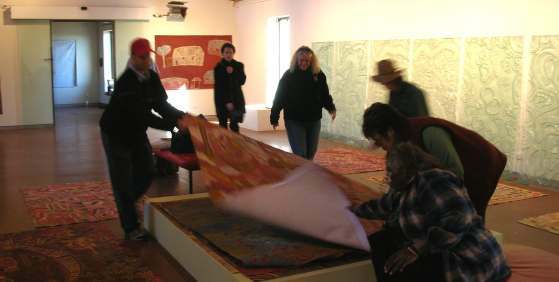 A new program of exhibitions is underway to promote the work of Warburton Arts Project, which until recently has focused its energies on building the collection at the Tjulyuru Centre. When we were there, four artists had just returned from an opening at the Gadfly Gallery in Perth. 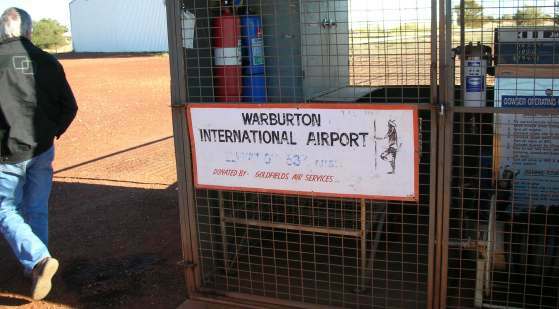 There are numerous other activities underway at Warburton. The Warburton Youth Arts Project, also known as the Nintirringkula Team, sponsors a broad variety of workshops and activities designed to bring the young people in the community into the Centre to learn about music, crafts, painting, photography, film, and computer applications. They even have their own blog now! 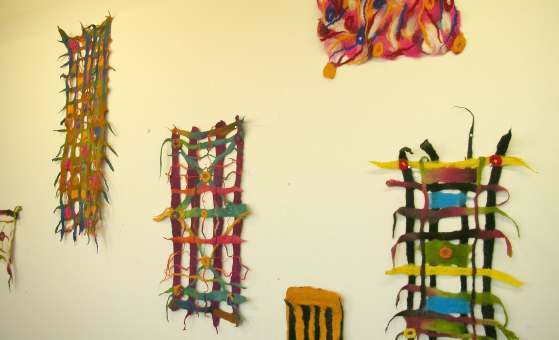 The WYAP had recently held a series of workshops introducing felting, and the results were on display—and for sale—in the small gallery near the entrance to the arts complex. Leading the Youth Arts Project, Janet Vost is straining up a new generation of artists who may find expression in media beyond traditional canvas or the spectacular glassworks that Warburton has pioneered. You can catch the Warburton Young Fellas’ rap music video fellas gangsta on YouTube, or the charming clay animation story of Warnapi, the water snake by Kressna and Terri-Anne. Honey Ants, directed by Prudence Andy, is a video/slide show combination set to Blekbela Mujik’s bouncy “Don’t Worry, Just Be Happy” that shows the practices and pleasures of gathering bush tucker. 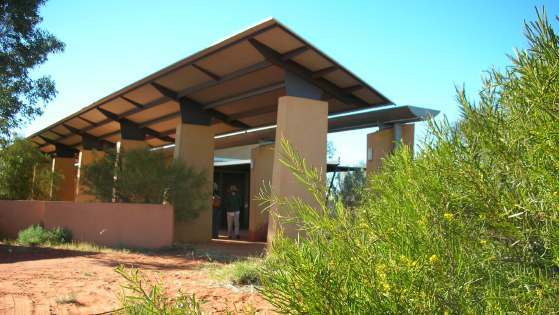 Across from the galleries are a variety of business offices, an information centre, and the gallery shop, where publications of the Warburton Arts Project were on sale, includingNgayulu-Latju Palyantja: We Made These Things as well as Trust, a catalog produced to accompany a multimedia exhibtion on Ngaanyatjara and Pitjantjatjarra responses to mining, and Mission Time, a similar publication documenting the days of the Warburton Mission. There were also canvases and crafts to be had, and I picked up a CD of tunes by local rock ’n’ rollers. This entry was posted in Art, Communities, In Australia and tagged Austrade Tour. Bookmark the permalink.